Earthquake Exodus, 1906 unveils a history of the refugees of San Francisco who fled to Berkeley and the ten-week relief effort that followed. In its day these events were monumental but were forgotten within a generation. Historian Richard Schwartz has plumbed the depths of these events and offers up stories, details and subtleties of the relief period like a feast. One of the most notable facets that comes out of his research is how no one waited for the government to take over, organize or support the efforts. This book will serve us very well. "When I returned home this afternoon, I discovered Earthquake Exodus 1906 ... I have now spent a most pleasant two hours with the book and send along my appreciation and my congratulations." "…I am pleased to recognize and honor the selfless contributions of the people of the City of Berkeley on the occasion of the 100th anniversary of the Great Earthquake of 1906. The Relief and assistance the Berkeley community gave to San Franciscans after the earthquake was invaluable to the reconstruction of our City. Thank you!" "I very much enjoyed reading this book and adding it to my personal library...While UC Berkeley has committees, plans and infrastructures in place for a major disaster and response, your thoroughly researched account of actual 1906 history should prove invaluable." 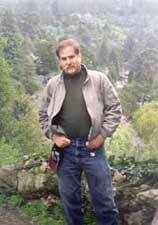 Dr. Gray Brechin, Geographer and author of Imperial San Francisco: Urban Power, Earthly Ruin. "…On April 17, 1906, the university town had twenty-six thousand residents. A year later, it had grown by half again to thirty-eight thousand, largely due to the influx of homeless refugees fleeing the afflicted city. Schwartz explains how Berkeleyans generously responded by setting up temporary camps, dispensing food, listing jobs, and even taking in the homeless. He details the measures taken to ensure public order and health as city and university officials struggled to deal with thousands of disoriented, impoverished, and sometimes dangerous strangers, many separated from their loved ones, and everyday details long forgotten but worth study by those who wish to better prepare for the next great shake." Earthquake Exodus, 1906 is listed as a resource book on the UC Berkeley's Bancroft Library website- "The 1906 San Francisco Earthquake and Fire Digital Collection." 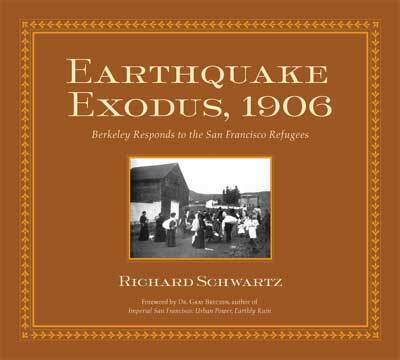 "There will be many books this year to mark the 100th anniversary... EARTHQUAKE EXODUS, 1906 is one of the best and perhaps the most unique...His account is often vivid in detail and even thrilling...Schwartz provides in astonishing detail...thus making the book amazingly useful for today's reader or researcher. EARTHQUAKE EXODUS, 1906 will certainly be one of the basic works in the history of the aftermath of the San Francisco earthquake and fire...Bravo Richard Schwartz!" "...more important than the amazing visual feast Schwartz provides us with the stories he retrieved from the "dust bin of history." ...we are so enriched by Schwartz having saved them....and are inevitably drawn to comparing it to our own response to the Katrina disaster, we are sobered and wish to read more to glean the simple secrets of their success. This book is a gift to the citizens of 2006 of the Bay Area and beyond, just as the citizens of 1906 gave their gift to the refugees...Schwartz has done it again and we suggest you partake in reclaiming this monumental and thoroughly forgotten Bay Area history. Earthquake Exodus, 1906, Berkeley Responds to the San Francisco Refugees is a work of art and masterful history telling. We guarantee you will feel proud, good and better prepared after reading it." "I have read it through and enjoyed it imensely. I thought your description of the plight of the first few days after the quake were the best I've read of all the stories of '06. Nicely Done!" SFGATE, the San Francisco Chronicle's website posts a photo feature of the book "Earthquake Exodus, 1906." "This book is a new and amazing collection of images...This book is a wonder--well written, concise, a time capsule of a moment just over a hundred years ago of a time of utter and complete transformation of two cities and centuries and ought to be a part of anyone's library who has an interest in the City that was. Earthquake Exodus will arouse no end of interest in the town of Berkeley and its role in recovery from the epic disaster. Chapter 2: April 18, 5:14 A.M.